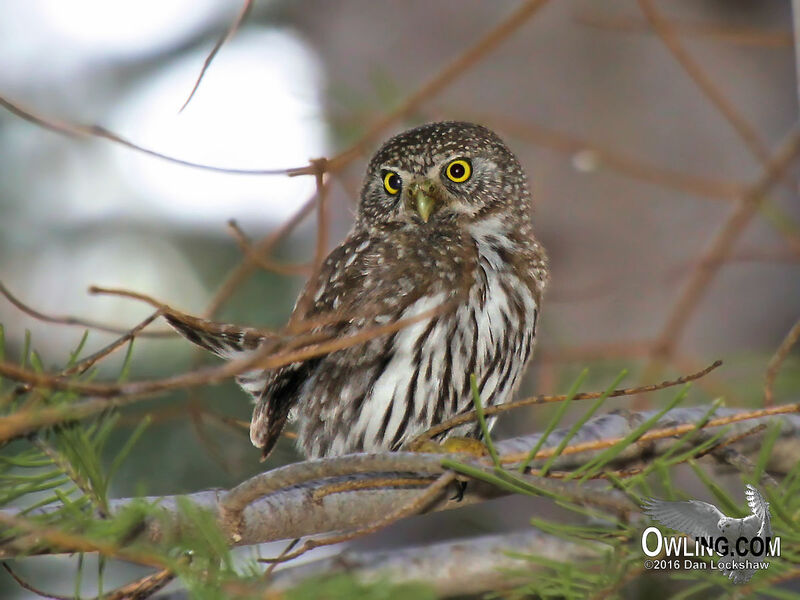 Subspecies: There are four races of Northern Pygmy-Owl in North America. G. c. swarthi is restricted to Vancouver Island. G. c. grinnelli stretches along the West Coast of North America from S.E. Alaska all the way to S. California. G. c. californicum is the most widespread race in North America. It ranges from the northern interior of British Columbia and east to Alberta then south into Nevada and S. California . G. c. pinicola is found from Idaho and Montana south to California and Nevada. This race is sometimes combined with G. c. californicum. **Note: Because of recent DNA evidence, Northern Pygmy-Owl, which may have been formerly considered a race of Glaucidium gnoma, is considered in this text as its own separate nominant species; Glaucidium californicum with its four races defined above. The additional races G. g. cabanense, and G. g. haskinsii are also considered by this site as the separate species G. cabanense (Guatemalan Pygmy-Owl), and G. haskinsii (Baja Pygmy-Owl) respectively. G. gnoma (Mountain Pygmy-Owl), which ranges from S.E. Arizona and S.W. New Mexico south through the interior highlands of Mexico to Oaxaca is accepted as its owl species by this site. 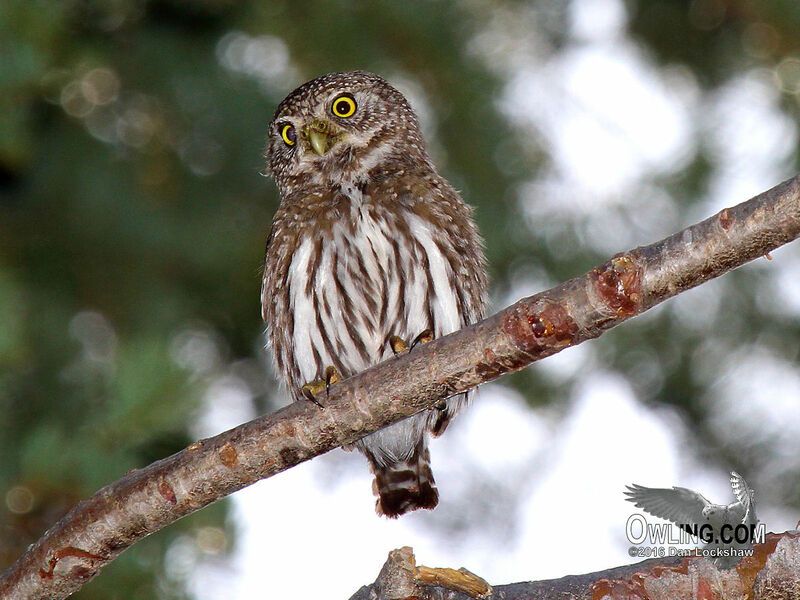 If the AOU & ABA also accepts this division we will have a new species of Pygmy-Owl in North America(! ), the Mountain Pygmy-Owl. The Mountain Pygmy (G. gnoma) is also slightly smaller (.4in. average) than the Northern Pygmy-Owl and its toots (notes of call) come faster and in pairs of 2 notes where the Northern Pygmy-Owl (G. californicum) has slower evenly spaced single notes to its call. Length: 7 – 7 1/2 in. Tail: 2 1/4 – 2 1/2 in. Average Weight: Female: 2.6 oz. Description: A small owl lacking ear tufts. Male and female are identical in plumage. Except for a very limited area in Southern Arizona where the Ferruginous Pygmy-Owl is also found (see the Ferruginous Pygmy-Owl biology for the differences), this little owl is not likely to be mistaken for any other owl. First this is a diurnal owl (active in daytime); its small size, plump shape, long narrow tail, bold white eyebrows, brown streaks on white under parts, and white spotting on a brown head and forehead make it very distinctive (the backside is also brown with larger white spots). It has 2 black patches on its nape, outlined in white, that vaguely resemble an extra set of eyes. It has a dark brown tail with white bars; grayish-yellow bill (darker at the base); and lemon yellow iris. The owl becomes more grayish-brown overall in the Rockies and there is a red phase bird that is more cinnamon-brown overall. This little owl is very bold and will often allow a very close approach. Although it is not brightly colored, it very often brings a crowd of mobbing songbirds along with it that will betray its location. It also has a distinctive low evenly spaced toot (call) that makes finding this owl among other daytime birds easier (regularly calls although actively vocalizes most in March through mid-June and September through October). Young: The young are similar in plumage to the adults. Just like the Ferruginous Pygmy-Owl the young do not develop their white markings until they mature. As a juvenile owl the white spots on the crown are not developed. The Northern Pygmy juvenile is still distinguishable from the Ferruginous Pygmy, in the small range where they could possibly overlap, by his white tail bands (the Ferrug. having reddish-brown bands). 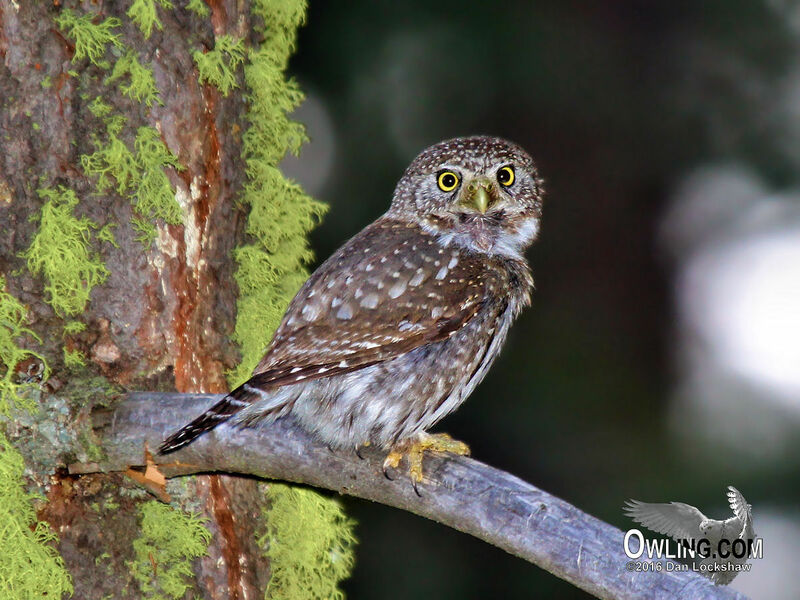 The Northern Pygmy-Owl has a wide range of forested habitats. In its western and Sierra range it is associated with blue oak savanna to montane conifer forests. Its normal range is about 3000 – 6000 ft. in elevation. It may move into lower elevation in the winter months and alternately nest as high as 8000 ft. in the Sierras (it is rare on the east slope of the Sierras) the highest frequency is at 4000 – 5000 ft. in elevation. In the Rocky Mountains the Northern Pygmy may range as high as 12,000 ft. and may also descend into lower prairie habitats well away from forests. 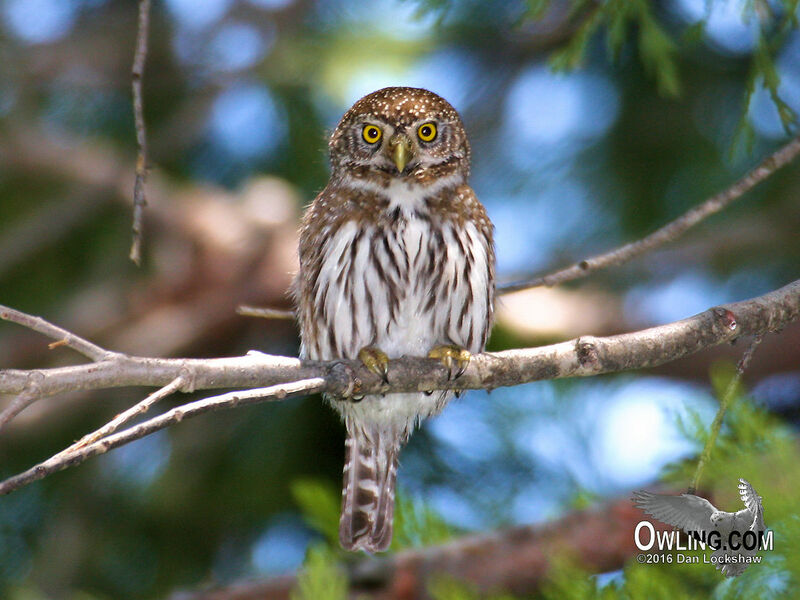 In general, the Northern Pygmy-Owl is found near edges of meadows, lakes, burns, and other openings in the forest. They will rarely or never be found in unbroken dense forests. Where the range of the Northern and Ferruginous Pygmy-Owls overlap in Southern Arizona, the forest habitat of the Northern Pygmy and the mesquite/saguaro desert habitat of the Ferruginous pygmy make the owls ecologically isolated. The list of possible prey in the Northern Pygmy-Owl’s diet is quite large. This may include all of the small mammals, small to medium sized birds, reptiles, larger insects, and amphibians within their range. The Owl’s preference seems to be mice, birds, and large insects with studies indicating that about 90% of their diet is comprised of small mammals and birds. This little owl is a bold and ferocious daytime predator. It will kill birds such as Gambel’s or California Quail that are more than twice its weight. To see a Northern Pygmy come tumbling out of a tree with its talons firmly locked into an American Robin, that is half again its size, is an impressive sight and reminder of how fearless it is. The Northern Pygmy-Owl is seasonally monogamous. Nest sites are typically found in woodpecker holes or dead tree cavities. Egg records for this species range from late April through late June. Average clutch size is 3 eggs but there may be as many as 7 or as few as 2; incubation lasts 28 -29 days and the eggs are not incubated until the clutch is complete. The young subsequently all hatch usually within 1 day. The male feeds the incubating and brooding female for approximately 9 days after eggs hatch at which time the female will begin to forage. Fledging occurs at 23 -30 days although parental protection continues for 20 -30 days after the young fledge. Signs of sexual maturity begin to show at only 5 months although the age of the first breeding is probably 1 year. There is no known migratory movements of this owl. The Northern Pygmy is believed to be largely sedentary. Except for winter downslope movements and juvenile dispersals there are no further records of movements for this owl. Further studies are needed.